Bombari is a Cypriot traditional recipe which resembles like sausage but it is actually a cooked meal. The pork intestine is thoroughly washed and filled with a mixture of ground meat, rice, herbs and spices and then it is cooked. When slaughtering a pork in the villages, nothing was wasted. The intestines were used to make sausages but also this delicious dish. The most tedious part of this dish is the cleaning of the intestines, which might take more than an hour. Although it’s not a difficult recipe you will need someone to help you. If you do not have a sausage machine, you can improvise as I did, using a funnel or an old pastry piping bag without the nozzle. My mother used to make this and we loved it. Although I did not have a recipe for this, however, I could remember the way she used to make it and I tried to recreate it. I also remember that she would cut the minced meat by hand, using two sharp knives in opposite direction. However, I did not know if she used sheep, goat or hog casings, so I preferred to use pork casings. I also could not remember if there was cinnamon in it, but I added some and the final result was quite close and in any case it was delicious. I know that some of you may feel disgusted at the site of the intestines but believe me if they are properly cleaned they are much better than using synthetic casings made of cellulose, collagen, fibrous or muslin. Sausage casings cannot be found in Athens, so I had to make a special order to my butcher. His supplier sent the entire intestine, which was a lot of meters long, and fortunately it was cleaned and washed, but nevertheless I also washed it many times to be absolutely sure that we could eat it. After washing it, I have kept some of it in the deep freezer as I intend to make this again and I also intend to make sausages. The recipe is not at all difficult although we had a little difficulty at the beginning with the procedure of filling them, but once we found the best way it was easy. The small sausage machine I had was not at all practical, so in the end I used an old plastic pastry piping tool which I never use any more. Wash the intestine under cold water, filling it with water. If it is too long you may cut it into smaller pieces, in order to handle it better. Then in a bowl add water, vinegar, lemon juice and salt and rub all the pieces well. Rinse them and then clean the inside. Take an end and fold it inside, then with the other hand using the back of a wooden spoon or the back of a knitting needle start pushing the rest inside, until you see it coming out the other end. Fill the intestine with water, so that it runs out like a long sausage. The fatty outside is now in. Repeat the same procedure as before, washing them with vinegar, lemon juice and salt and then rinse again. Finally turn them over again and wash them one last time with lemon juice and vinegar. Leave them in this solution for an hour and then rinse. For the filling mix the ground meat, with onions, parsley, tomato, rice, olive oil and spices. Make a knot at the edge of the intestine and start filling the casing. You may add some water in the funnel so that the meat can get in easier. When done, tie the end and then to form into a sausage twist the casing every 12 centimetres (4 – 5 inches). When done, take a pin and prick it in various parts so that the water may be removed. If you decide to make a larger quantity, at this point you can freeze them for future use. Put the stuffed sausages into a large pot, cover them with water and bring to a boil. Remove any froth and then add a tsp of salt, lower heat and simmer for 30 minutes. Remove to a colander to drain. Heat olive oil in a skillet and fry sausages on both sides. Remove on kitchen paper to absorb extra oil before serving. Bombari is a sausage filled with pork mince and rice, using the intestines. Make a knot at the edge of the intestine and start filling the casing. You may add some water in the funnel so that the meat can get in easier. When done, tie the end and then to form into a sausage twist the casing every 12 centimetres (4 - 5 inches). When done, take a pin and prick it in various parts so that the water may be removed. If you decide to make a larger quantity, at this point you can freeze them for future use. Oh god! I’ve gone to sausage heaven! I love this Ivy but I’ve never heard of the Cyprian version. (I love “splinandero”…my dad makes it)…I’m already licking my lips in anticipation of the Spartan sausage. Can’t wait! The next time I’m in the neighborhood, I’m coming over for Bombari. I never even thought about making my own sausage but you make it look not too difficult and I imagine the pride of doing it yourself tastes very sweet next to the meat. 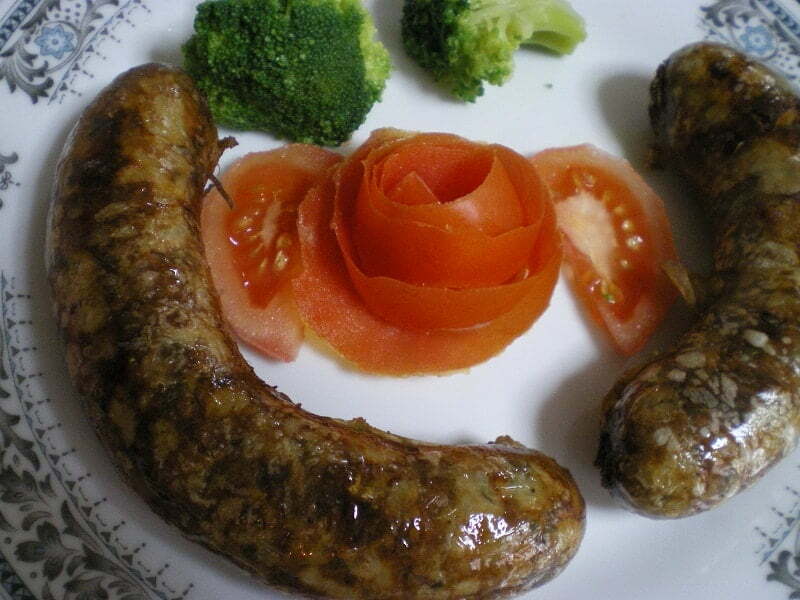 I love sausages and when made at home, you know exactly what you’re getting. Thanks for introducing Bombari as it’s new to me. No casings in Athens? Perhaps at Varkakeios? You did a great job! What a brave woman you are, you make it look so easy! I bet they were delicious. Whoa, holy sausages! You must know I love my kielbasa, but I’m always up for something new. I think it’s fun how different all sausages can be around the world. you are an expert! wow! The recipe looks so good. And the pictures too. Even though I don’t eat pork, but hubby would surely drool over these. I don’t know if one could buy intestines so easily here locally. But, even I would prefer the natural product to the others, if I were ever to make them at home. Ivy, that is fantastic! I haven’t made our own sausages although we home-kill our lambs. We can’t use any casings because the ones sold are usually Pig’s. I don’t know if lambs’ can be casings? Not sure. Well, excellent work, Ivy! Gr8 job ivy! Looks tedious! Wow, I am impressed – first you make filo, then you make sausages (or a sausage like dish)! These look really good. I think we would have to special order the casings as well sis, but these sounds incredible!!!!!!!!!!!!! Oh my goodness. Such a devotion to making sausages! The end product looks very good. Most of the process looks like fun, but I’m not sure I would love the intestine cleaning part.